What is a flue pipe? The flue pipe is a duct pipe that vents, or exhausts, gases from inside the home to the outside. A byproduct of combustion contains carbon monoxide and other dangerous compounds. The purpose of the flue pipe is to remove harmful byproducts of the combusted, or burned, fuel from inside your home. If the byproducts are not properly ventilated from inside the home, then you can have a dangerous buildup of carbon monoxide. Therefore, we recommend having one of our service technicians inspect your flue pipe before you start operating the furnace. Check the batteries in your carbon monoxide detector or have our technician install a detector during your next furnace inspection. In addition, the filter must be changed regularly during the months of operation. A heavily impacted (dirty) filter can also back-draft the flue pipe since air is pulled from the least point of resistance. What’s the difference between single & double wall flue? 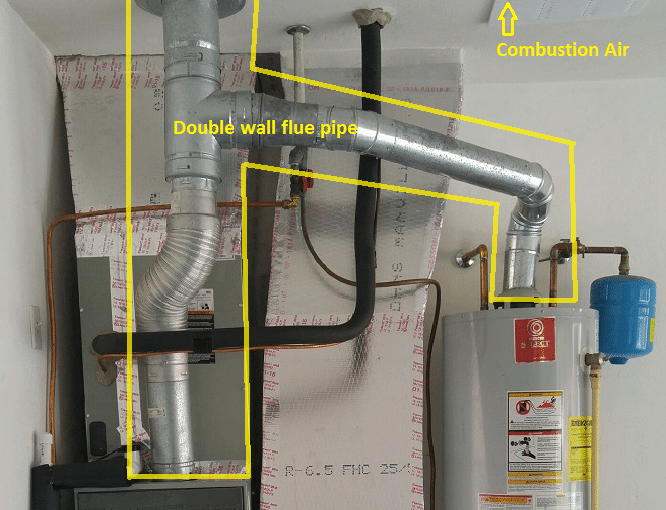 Florida building codes require the design of the flue pipe to be single or double wall depending on the number of appliances sharing the flue pipe. If you have one gas appliance using a flue pipe, then single wall is sufficient. However, if you have two gas appliances sharing a flue pipe, then it must be double wall as seen in the image featured above. Combustion air is a source of oxygen needed to burn fuel such as natural gas or liquid propane (LP). You can’t produce a flame in a furnace without proper combustion air. The image above shows the combustion air as a vent in the garage to pull air from the attic. When/where is combustion air needed? Always. Proper ventilation for combustion air is always needed. For the furnace to operate properly, it must have an adequate supply of combustion air. Have you checked your flue pipe this year? Furnaces that are not operated for months at a time can have obstructions. A bird can build a nest in your flue pipe, or an unfortunate rodent can fall down the flue. Contact our office today and have your furnace inspected by one of our skilled technicians. Keep your family comfortable with furnace repair services and maintenance by Bertie Heating & Air Conditioning!